Great book presentations can come from anywhere. Comics for example. Last year, Dark House press took a somewhat notorious, very early draft of George Lucas’ Star Wars and serialized it in comics. The comic series is probably the closest that rendition this early Star Wars history will come to in a visual media. The story is very different from the one we saw in Star Wars: A New Hope, characters, aliens, technology, even the force itself changed in subtle to extreme ways. It’s an entertaining read for any Star Wars fan. The Star Wars franchise has a long history in the comic form, the individual movie serializations and additional stories made up for the time between films and were quite successful for Marvel comics. More recently, Dark Horse comics has taken the Star Wars Expanded Universe into some amazing storylines far beyond the film canon. And it was really no surprise that Dark Horse put a tremendous amount of effort into a boxed edition of the collected seminal work. This set of three volumes of material is presented in a sturdy and attractive cloth-covered, foil lettered and embossed box, the design repeated for the three volumes enclosed. You can find this edition for sale now, but I’d act on it soon because who knows when it will sell out! There are few books I own that deserve the distinction of being called ‘luscious.’ In my eyes, that term requires a number of things. First, it must be a delight to hold; the kind of book that if you place it in one hand, the other MUST stroke the cover gently. Second, it must feel substantial, like you’re actually carrying something. Third, it must smell right. Old books have that, but once in a while a modern one will pass the sniff test. This collection of W.H. Hodgson‘s stories is luscious. Let’s start with the obvious – the cover image. Jason VanHollander created a magnificently strange collection of characters all tied into one busy, but beautiful, image, embossed in silver, as the cover. The entire effect is difficult to photograph, but it’s lovely. It’s exactly the kind of image that should adorn both a volume of one of the premiere horror writers of the last ever, or a book called ‘luscious’. The image is repeated, in regular black ink, two pages in to the book. That image has the feeling of a wood-cut, and shows how remarkable that over image is. The faux leather of the cover is really nice, and the choice of the dark blue adds to the antique feeling. It seems so appropriate that a book containing so many Carnacki stories (my favorite!) would be bound in deep blue like this. It imparts something of the feeling of those old tomes of the 19th Century, while at the same time not feeling like they’re going for that feeling by overdoing it. The back of the book has a lovely image of Hodgson stamped on it in the silver as well, which is a nice touch. That same image is also repeated in black ink in the book itself. I like that touch as it is much easier to appreciate on the regularly printed page. The spine is interesting, and I say that in the English meaning of ‘Interesting’ (ie. Being of Interest) as opposed to the Chinese meaning (ie. any damn thing anyone wants to assign it, apparently) because it is what first drew me in. There’s a simple 8-point compass-like logo at the top identifying this as Book Two in the series of The Collected Fiction of William Hope Hodgson, and then the title and the lovely Night Shade Books logo at the bottom, all in that stamped silver again. It’s subtle, but not 21st Century subtle, but more 19th Century subtle, which is slightly busier, and easier to stand out. When I have this book among others on my shelf of Precious, Ornate, Expensive, and/or Luscious books, it stands out as one of the best-designed spines of all of ’em. If there is one disappointment, and if I were a harder man it would hold it back from that Luscious moniker, it’s the endpapers. They’re white. Plain and simple. It’s not a bad thing, I get the choice, certainly, but they’re kind plain for a book presentation so richly complex. A splash of burgundy, or perhaps a little marbling? Anything but plain white! The font choice? Solid. Just enough of a serif on it to give it a slightly antique look. I think it’s called Plantaginate, and it’s pretty, while still managing to be clear. I always like that in a font! There’s a handy index in the back that talks about the first publication of the collected stories, and a bit of background on how they chose which version of the texts. That sort of thing is always useful, though it may fall a bit too close to content for this actual review! All in all, Night Shade Books, and editor Jeremey Lassen, has given us as Luscious a book as you are likely to find out there at the price point. The fact that it’s a collection of one of the essential horror writers only amps up its Luscivity! Why would you wrap a beautiful work of art in a plain bronze wrapper? It’s like the way Brighton Pavilion would cover over the lovely wallpaper and trim of one time period with the drab paint of the next. Sadly, that’s exactly what the folks at Folio Society have done with their release of Crime Stories of The Strand. You remember the Strand, right? That hugely important English magazine that was the most important periodical from 1900 to the start of World War I. It was so popular that there was an American edition as well. HALF A MILLION copies a month. Imagine that happening today. It was an unstoppable jugglenaut of a magazine! Now, the London Folio Society put together this lovely collection of stories, ranging from Arthur Conan Doyle and G.K. Chesterton, to a certain Agatha Christie. And the cover, a lovely puzzle-themed, two-color piece with exemplary cross-hatching and woodcut line work. It’s a marvelous work, lovely, giving off an Edward Gorey-like vibe. David Eccles The purple-blue of the hardcover shows through the black-and-gold printing and it’s spectacular. Then the fools put a dull gold hard book box around it! Why would you do that? There’s literally nothing on the case! It’s a dull gold box which gives no impression of what’s inside. The spine shows two chunks of gold background indicating the title and Folio Society. THAT”S IT! They completely obscured the incredibly beautiful image with that lame lamé case. It’s an unfortunate decision, and I’d keep it on the shelf not in the slipcase if it wouldn’t feel like it were no longer Mint In Box! The choices for binding and hardcover board choices are pretty solid. The binding does have a certain stiffness to it, which leads to a cracking sound, perhaps aided by the fact that the whole thing is compressed every time you put it back into the dull gold slipcase! The outer fabric is the ideal cover tone, in that purple-blue that reminds me of pipe smoke in Grandpa’s den. The endpapers are in a lovely wine and is the perfect counterpoint to the purple-blue. The typeface, Ehrhardt, is clear and feels somewhat antique, but not overly so. In fact, it feels Modern. Not contemporary, but solidly, and notably, modernist. I love that! The book was designed by David Eccles, including the text and the binding, which shows in his artworks, which are not only line drawings, but also some beautiful stipple art. I love Stippling! All in all, it’s a wonderful product, sturdy, with heavy paper and richly inked text. The edge coloring is in that same wine tone, which is only done on the top of the book, though it really doesn’t matter, BECAUSE IT’S COVERED BY THE BREAKING SLIPCASE! It’s clear this work has been a labor of love, and obviously well-done, as you would expect from the London Folio Society! I’m a big fan of books. Not just the stories, but the book construction as well. From bindings, paper choice, typeset, typography, layout, it’s all interesting to me. 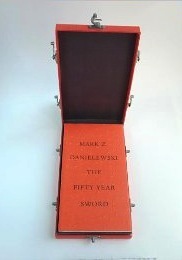 Mark Z. Danielewski is most famous for House of Leaves, an inventive experimental work of layered stories and typographic morphing of most everything we think of as the printed page. In this video I do a short review of House of Leaves for those who are not familiar with the work (and to allow those familiar with it to berate and chastise me for “getting it wrong” I suspect) and then do an unboxing of his latest work The Fifty Year Sword, which comes in a unique box and exhibits some of the same traits found in House of Leaves. I hope you enjoy, and I hope those trying to make a purchase decision on this book are aided in their decision making.